I’ve been trying for two months now to get a new residence permit, a three year one because that’s when my passport will have to be renewed so that’s all I can apply for. What prompted this was the dramatic reduction in price of the permit. It now costs less than a quarter of it’s price a few months ago so it’s a ‘no-brainer’ as they seem to say these days. The first time I went to the Yabancılar Şube Mudurluğu (the department managing foreigners) in Kemer was at the beginning of April shortly after this price reduction but I was told to go and get a new one at the Turkish Consulate in London because I had a Title Deed (Tapu). Well after a lot of phone calls that turned out to be incorrect and I was told about it the following morning but it put me off going again for a couple of weeks, I thought I’d let them iron out the wrinkles in new system. The second time I went, two weeks ago, I again had a problem beyond my control. One of the documents that I needed to present to them was a letter from my bank certifying that I had the requisite amount in my accounts to live in Turkey for the three years, they don’t want me to be a drain on their social security system. I’m not entitled anyway but that’s neither here nor there. Unfortunately when the bank wrote the letter for me they included my middle name, but my passport doesn’t show my middle name, so it wasn’t accepted. I could have been somebody else, by this time I wished I had been somebody else! Anybody else! Yes I know, it does seem a strange thing but when you’re dealing with officialdom sometimes strange things happen. Here strange things happen a lot so although I was surprised and extremely annoyed I bowed my head and drove home. Oh! Did I mention that the office I went to was two and a half hours away by car? Well it is and I’d wasted ten hours by now, not to mention the petrol. I went back last week (2.5hrs) with the offending letter now reprinted and my name changed so as to tally with my passport. Great, this time for sure. Wrong! Years ago applicants needed a certificate of address from the Vice Governor’s offices confirming the address at which you live. Then they started asking for utility bills so I had taken along my bills but they caused uproar and hilarity in the office. Apparently “on the right as you enter Çukurbağ village” was not specific enough. They wanted a house number, I told them eighty seven but no, only a certificate from the Vice Governer’s office would do. I leaned on the counter with both elbows and held my head in my hands, then looked up at the policewoman with my best puppy-dog eyes and said “but I’ve been here three times so far, if I leave the stuff with you and you issue my permit, when I come back to collect it I swear I will bring the address certificate with me, is that ok?” Well women do that sort of thing to men all the time don’t they, so I don’t see why a bit of equality shouldn’t creep in on my side every now and then. Anyway the policewoman she say yes! So then I had to go and pay at the Tax Offices two miles away and returned after having lunch to give them the receipt and get a ticket bearing the date for me to go back and pick it up. While I was having lunch I noticed a tyre fitters shop next door so enquired about the cost of new tyres for my car. Reasonable price, instant fitting and balancing so I said I’ll be back next week, then I went back home (2.5hrs). On Monday this week I went and got the address certificate in Kaş, what number is your house they asked, eighty seven I said, so then they printed out the document and gave it to me. It took two minutes to get certified proof that I knew my house number! On Wednesday I took my scooter for it’s biennial roadworthiness test. There were too many there to be done in one day so I left it in Mehmet the mechanic’s capable hands to get it done on Thursday. On Thursday I went (2.5hrs) back to the Kemer, left my car with the tyre fitter for four new tyres and crossed the road to the office. 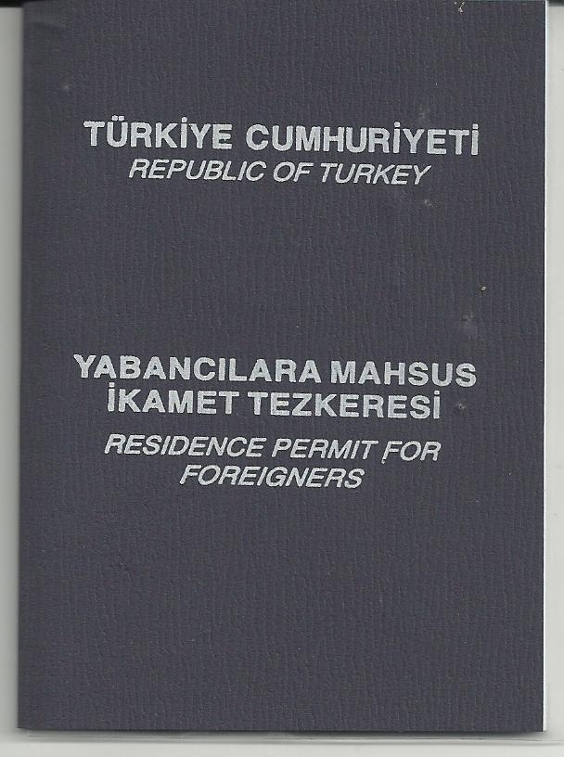 My new residence permit was ready, I handed over the address certification and walked out a very happy and mostly legal resident of Turkey again, it’s good to be back in the fold. When I got back home (2.5hrs) I found that Mehmet had got my scooter through the test successfully, a couple of minor things to be repaired but it’s legal to ride it anyway. A good week, I had a glass of wine to celebrate. Ah! Spring! The time when the sap rises and a boy’s interest turns to…..concrete! Well a boy probably also has other things on his mind and concrete may not be top of the list but beggars can’t be choosers, so, in the absence of something warm, soft and cuddly, I finally got round to making another major improvement that has been on my mind for a couple of years. My wooden veranda floor has done well to put up with neglect and the ravages of the weather here, being alternately soaked and baked dry during the winter and brought nearly to spontaneous combustion during the summers. 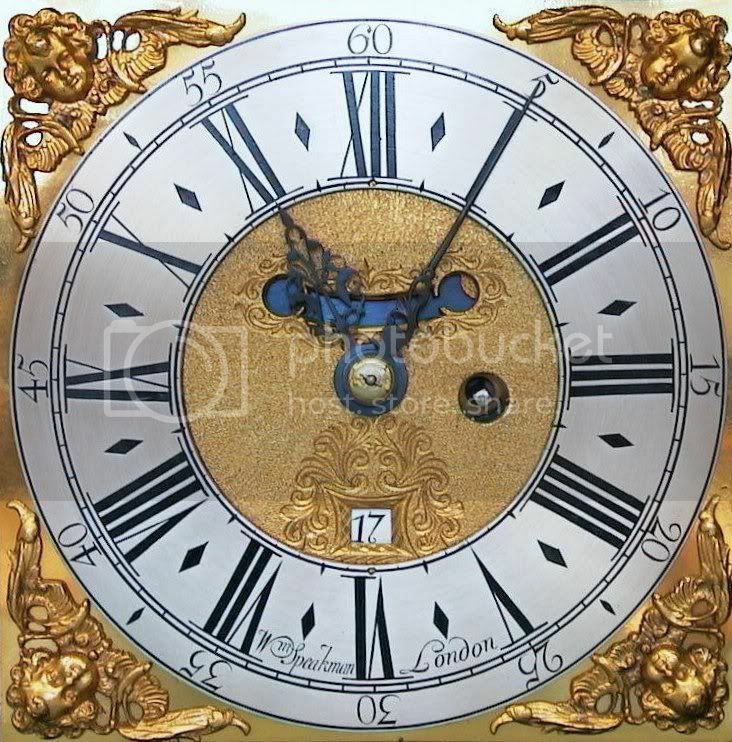 Most of the wood is still in good condition however the fixings suffer more than anything. The constant movement of the wood due to large temperature changes plays hell with the security of nails and also breaks screws with the expansion of the wood when it gets wet. Thus I decided to put phase three into operation. 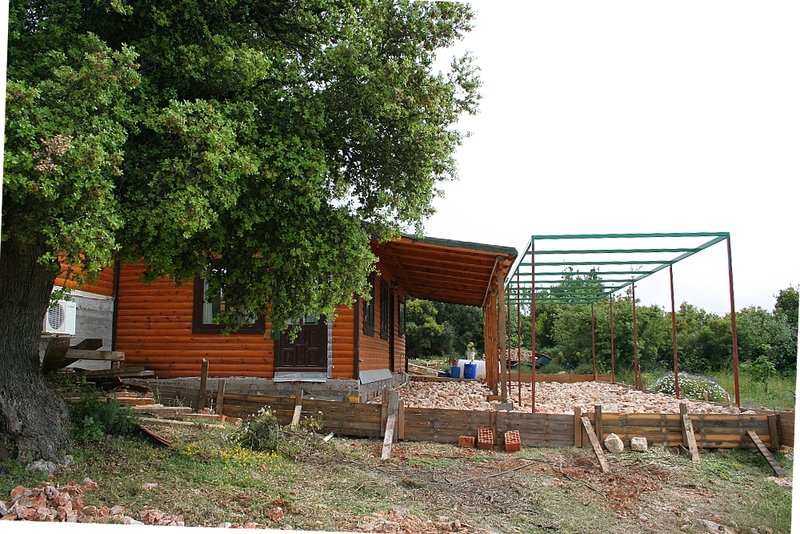 I had planned to employ two of my local friends, Suleyman and Ali, to help me and I had a timeframe at the back of my mind however last Tuesday Suleyman told me to dismantle the veranda on Wednesday as they were coming to bring tractor loads of rock to make a foundation for the new patio. Forced into action I spent all day Wednesday slaving away painstakingly taking it apart in order to have useful wood rather than a pile of broken bits. In all I spent about 12 hours with only a couple of breaks to eat and managed to get it cleared away enough for the stone to laid. It’s a strange phenomenon that happens here, you can sit around and chew the fat for weeks on end sometimes but once one of the guys makes a decision it means total dedication to the job in hand. Anyway that sets the scene and frustrated as I was about being catapulted into all this back-breaking labour I was pleased that it was being done. 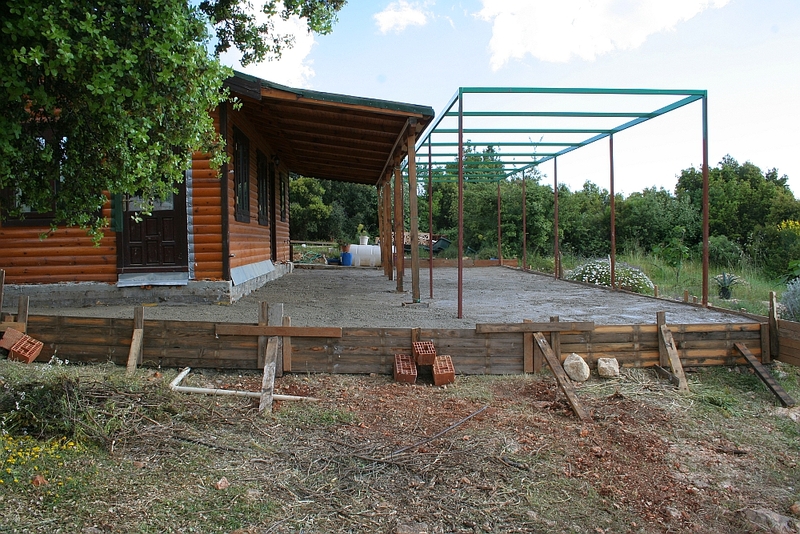 Ali had to leave the village here and go up to the yayla in a few days so my thoughts of the three of us mixing concrete by hand and the camaraderie of shared work had to go out of the window to be replaced by a delivery of ready-mix concrete poured into place by boom pump. I had expected the job to take about three weeks, as I write three days later it is all over bar the shouting, the fat lady has finished the last chorus and I’ve been able to sit around today and recover my wits a bit (not that there are that many to recover anyway) I’ve even had a phone call to talk about “that wood you want to get rid of”! and the concrete going off in the evening light. Because the concrete is a base for flat stone being laid on it we didn’t need to smooth it all off to a perfect finish, minor ripples and unevenness are therefore not important. I have a friend who spends most of her life in the east of the Antalya region in a place called Side. She decided to sell her house there and put it on the market a couple of years ago, since then she has steadily reduced the price until now it is only £53k. 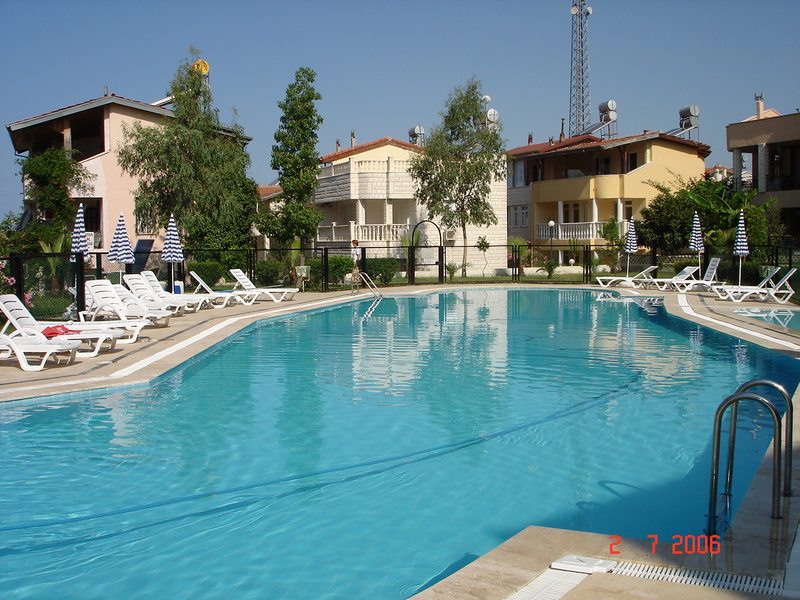 For this ridiculously low price some lucky person will get a beautiful villa located in Akdeniz Sitesi just off the Side to Kumkoy road, overlooking a communal swimming pool. Very few foreigners have places on the complex, most are owned by Turkish families – so they are at work all day and the pool is yours! Just a 10 minute walk to the beach and 5 minutes to shops, bars and restaurants. There is a bus stop right outside on the main road by the complex. Walk along the beach to Old Town Side in 30 minutes or take the dolmus there in 10 minutes for just a couple of Lira. 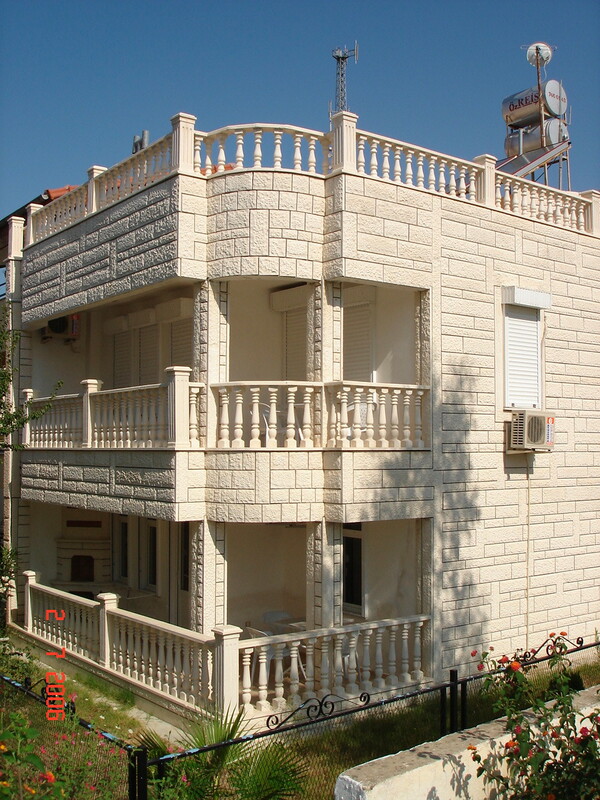 The villa has 2 bedrooms + 2 bathrooms (one on ground floor and one on first floor) and has planning permission for another 2 bedrooms to be built on the big flat roof however she preferred to use the roof-top as a party area or a romantic place under the stars at night with a glass of wine and someone special. Seriously people, this is a bargain, I’ve seen it and she is giving it away at this price! UPDATE 13-6-2011 The house is now sold! Yippeeee!